For your using there is a functional to search for interlocutors in chats. With the help of the extension, you can easily and quickly set up sending invitations to the chats according to your wishes with help the wide range of criteria and parameters. Get ready to start working and get acquainted with the basic tools. Save the changes – and it’s done! Men from the Blacklist will never receive a chat invitation. “History” is an archive of your sent invitations to a chat. Here you can see the text, the number of replies, the date when the last message was sent. Let’s find out the way it works! First of all download and install the extension in your browser. Go to the LiveChat page on the charmdate.com site. Before starting work, it is important to pay attention to the fact that you have chat invitations (templates) approved by the site. There are two types of templates on Charmdate.com: general templates provided by the website and your personal (Personal templates). So, there is the Personalized templates in the extension for chats, which you have previously created and approved. You will be able to start sending them. Therefore, if you do not have such templates yet, please create them. ◈⠀⠀Select the best send Speed for you. ◈⠀⠀Then in the Age section indicate the desired age of male recipients. or mark “Send different invitations” section and the extension will send different messages from your list randomly. ◈⠀⠀Additional messages are an opportunity to stimulate a man who views your profile to start a chat. 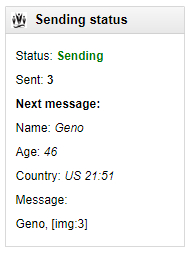 While he is watching your profile, he will receive two invitations from you with 15 seconds delay, and accordingly, this is a greater probability of starting a chat. Just select the templates from the list. ➫⠀⠀Ladies automatic authorization section . It is important to understand what this function is for and you should use it only in the case if you have the problem described below. In case you notice that your profile constantly or periodically goes offline on the site, and your search and communication are impossible, then the extension will help to re-activate your profile if it was deactivated by the site. Enter your password in the appropriate field. 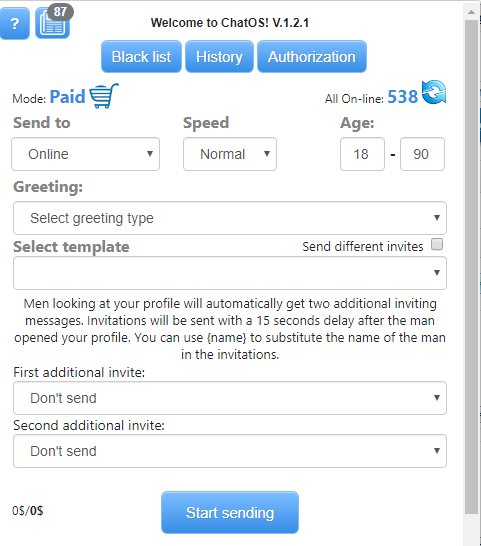 Using the extension for chats and the extension for mails, you can increase the chances to find new fans, get maximum results and enjoy your time on charmdate.com. We hope you will enjoy using the extension for mails on Charmdate.com from ChatOS. The ChatOS team wishes you to have a productive search and pleasant communication!